I had never been to Wind Cave before and appreciated making the connection with the place that figures so prominently in the Lakota (Sioux) peoples’ origins stories. The natural entrance is just a small hole in the ground, about as big as a basketball… but over 400 miles of cave lies just below. 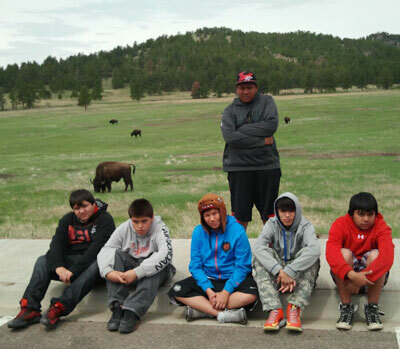 The Lakota boys saw buffalo at a safe distance in Custer State Park. The air in the cave is like the earth breathing as winds rush in or out to equalize the barometric pressure. The winds can reach up to 70 mph, and make a whistling sound. This is thought to be the place the earth breathes. As the story goes, the buffalo nation gave birth to the Lakota Oyate in this place. Our students can be a bit shy, so early on I encouraged them to think of a question or two they would like to ask when we toured a site. I appreciated how they were growing more and more comfortable opening up, and I learned a lot from questions I never would have thought to ask. On our way to the next campsite we drove through Custer State Park, and encountered several buffalo. At one point, we had to stop the bus as a half dozen crossed the road. One was a little too interested in our bus. Nate said he’d have a hard time explaining that damage to LeRoy in St. Joseph’s Maintenance Shop if the magnificent animal had gotten feisty. At our campsite, the boys enjoyed skipping rocks in the gurgling stream, balancing on a fallen tree that served as a bridge to cross and scaling the hills and dreaming of adventure. We visited the Crazy Horse memorial. Over 60 years in the making, the mountain will be twice the height of the Statue of Liberty when it’s finished. The four faces of Mount Rushmore could fit in the horse’s head. The site also includes a museum of the American Indian, which is a treasure. One of my favorite activities at Crazy Horse is visiting the workshop where Native American artists work at their craft – a showcase of numerous tribes from South Dakota and beyond. There are plenty of beautiful pieces for sale, but you can also just observe and appreciate their craftsmanship. They are also good about answering questions. A highlight for Craig was running into his grandfather who frequently paints there. 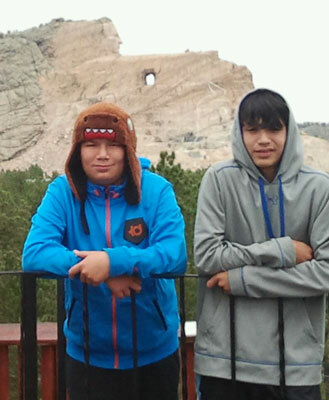 Caden and Trenton enjoyed the Crazy Horse Monument on a cool day. While we were in the neighborhood we also took in Mount Rushmore. While it’s a very different kind of cultural experience, we didn’t want to miss it. Fr. Jose is visiting us from Portugal, and it was high on his list. I was surprised that half of our students had never been there either. We returned to camp and roasted hot dogs and hamburgers over an open fire. One highlight of my time on this trip is the talking circle where each student shared observations and what they learned from the day.